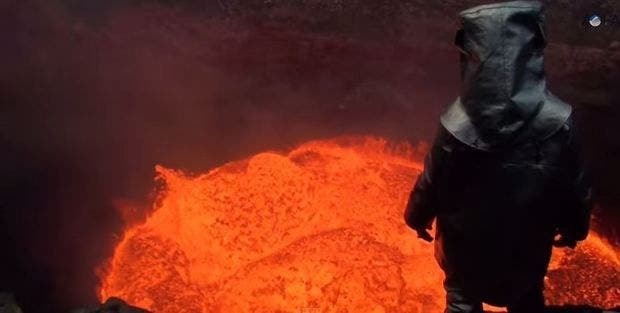 Sam Cossman and George Kourounis teamed up with legendary volcanic pioneers Geoff Mackely and Brad Ambrose to become among the first explorers to step foot inside one of the worlds most dangerous and inaccessible volcanoes, Marum Crater. Ambrym is a volcanic island in Malampa Province in the archipelago of Vanuatu, well known for its lava lakes. It’s a large basaltic volcano with a 12-km-wide caldera, and one of the most active volcanoes of the New Hebrides volcanic arc. The crater resulted following an explosion which took place around 50 AD. Its explosive force is rated 6, the second highest in the Smithsonian Institution’s Volcanic Explosivity Index ranks of the largest volcanic explosions in recent geological history. I couldn’t find out if the expedition also had a scientific part (a close-up study of the lava lake or sample gathering), or if it was just an adventure for the sake of it – but either way, it’s still one of the coolest (sic) things I’ve seen all year.